Though exercise has been the mainstay of musculoskeletal physiotherapy for decades, its value in other systems of the body, such as cardiovascular, respiratory and neurological has emerged in recent years. This trend is being increasingly reflected in degree curricula. This novel textbook is designed predominantly for physiotherapists and offers a dynamic insight into the applications of exercise therapy across the body's systems in disease management and health promotion. The focus on exercise as a crucial modality in preventing and treating disease will attract readers following courses in sport & exercise science and physical activity as well as physiotherapy. The book will also appeal to practitioners, particularly those pursuing post-qualification courses in rehabilitation. Ch2. Cardiovascular responses to exercise. Ch3. Exercise and the pulmonary system. Ch4. Exercise and the musculoskeletal system. Ch5. Exercise in diabetes and obesity. Ch6. Measurement of physical fitness and habitual physical activity. Ch7. Guidelines for exercise prescription. Ch8. Exercise in prevention and treatment of cardiovascular disease. Ch9. Exercise in the treatment of respiratory disease. Ch10. Exercise in the treatment of musculoskeletal disease. Ch11. Exercise as part of the multidisciplinary management of adults and children with obesity. Ch12. Exercise in the treatment of stroke and other neurological conditions. 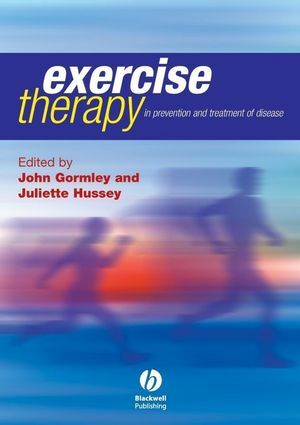 This comprehensive textbook on exercise therapy offers a dynamic insight into the applications of exercise therapy in disease management and health promotion. It is wholly evidence-based and uses a systems-wide approach. With a scientific and at the same time holistic approach, it engages with the preventative health agenda. Both the undergraduate student and the experienced clinician should receive useful information relating to exercise, its assessment and benefits. This reviewer found it very easy to understand, and a valuable addition to clinical practice… I would encourage all clinicians to have a copy available for reference purposes.